In a stunt that could seize the fascination of TV's late-night viewership, ABC late-night host Jimmy Kimmel said he would make a run for the office of the Vice President of the United States. During a taping of a segment for Thursday night's broadcast, Kimmel journeyed to Hollywood Boulevard on a double-decker bus and delivered a campaign speech. Upon the end of his announcement, his program was interrupted by CNN anchors Jake Tapper, Dana Bash and Wolf Blitzer who fired multiple questions at the candidate to discuss his newly announced effort. Kimmel's efforts are for naught – at least in the political arena. U.S. Vice Presidents may be elected, but they are chosen by candidates for President. Kimmel, however, is running for a different office as part of a much larger campaign: He is trying to win the biggest audience in late night, and, like the other hosts in the time slot, must come up bigger, outsize stunts that are ever more creative. NBC's Jimmy Fallon regularly beats both Kimmel and their CBS rival, Stephen Colbert in terms of audience size. But Kimmel and Colbert have been waging a battle for second place. Season to date, Colbert leads, but he had the benefit of launching a new tenure at CBS' "Late Show," as well of millions of dollars in promotional campaigns. In recent weeks, Kimmel's program is the one that has shown more strength, though Colbert has recently experienced a ratings boost under the aegis of a new executive, Chris Licht, who was named to oversee the program. 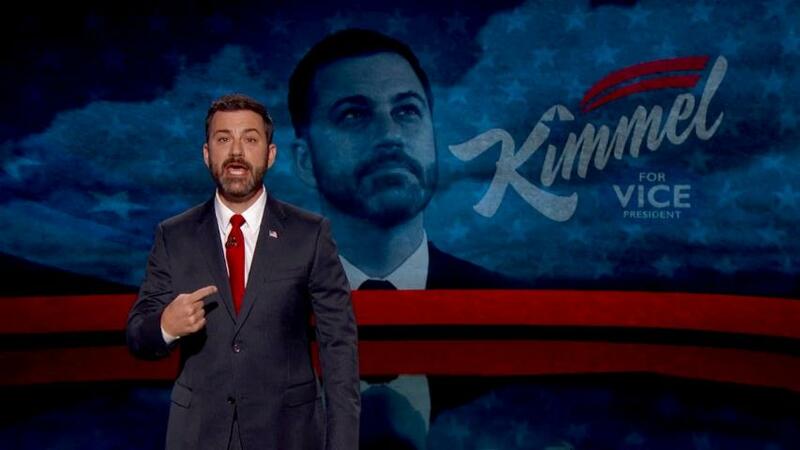 Kimmel's bid for Veep isn't the first political maneuver by a late-night host. When Colbert held forth on Comedy Central in 2011, he established a Super PAC, even enlisting the help of a former Federal Election Commission executive to help him fill out paperwork. Politics has proven to be the lifeblood of the nation's late-night programs in recent months. From Seth Meyers to Larry Wilmore, the various shows have tapped Donald Trump, Hillary Clinton, Bernie Sanders, Paul Ryan, and others to appear for interviews, skits and more. Kimmel may have little experience being Vice President, but one of his rivals might be able to give him tips. One of the highlights in Colbert's early tenure on CBS was his emotional conversation with U.S. Vice President Joseph Biden.